"The whole district was shocked when the news came through on Friday morning last of the death of Sgt. George McGowan, Carnamah, first young man to enlist for active service abroad. Coming to W.A. from Scotland as one of a number of picked boys chosen by the Y.A.L., he eventually arrived in Carnamah, where after being employed for seven years on Mr. C. Robertson's property he was later employed by R. Clark and J. Bowman. Although of a reserved nature he gradually began to take an active part in the public life of the district, and was an active supporter of the football and cricket clubs. Possessed of a magnificent physique he made an imposing figure in uniform, and we who knew him, feel certain that when the time came he upheld the great tradition of the A.I.F., and also of that country that has given to the empire some of its greatest soldiers. To his sorrowing father and mother in far-away Scotland, we extend our sincerest sympathy at the loss of their only child and to "Big George" we say farewell." 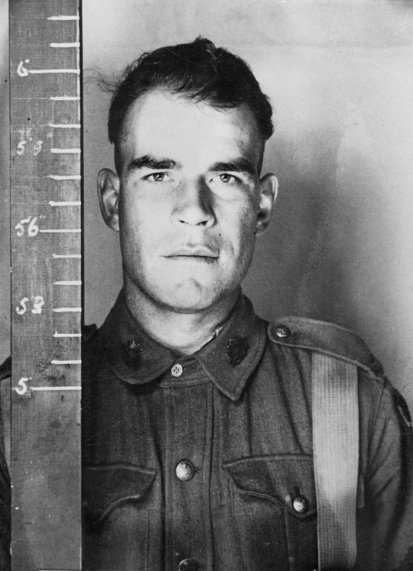 Photograph taken for his pay-book during the Second World War; courtesy of the Australian War Memorial, P02466.254.